Just dropping in to share the link to our latest episode of Taboo Mom Talk! For those of you who have been watching live, I am so sorry that Blab has had so many technical difficulties! We are actually in talks with the Blab team to figure out what is up (technically, Blab is still in their Beta version) and discussing the possibility of moving to another forum. For now, we love the way Blab lets us interact with all of our viewers live and shows all of our feeds/faces throughout the conversation (I mean, what would Taboo Mom Talk be without my ridiculous facial expressions?!). Anyway, episode three was really on a roll and I was loving it, so I hate that we only made it 30 minutes before Blab crashed. We decided to publish the video anyway so that those who missed it could see our talk with Courtney of Sweet Tooth Sweet Life because she is fabulous. We tackled all kinds of topics including the rude things people say when you are preggo with baby number 2, why some choose not to spill their baby names before the baby is born and all of our thoughts and feelings on the genders of our babes and future babes (Colleen, Courtney and I are all boy moms!). Colleen and I will be back next Tuesday at 8pm EST and I'll keep you posted if we change hosting sites! And I will forever be wearing my hair down after re-watching that video. P.S. 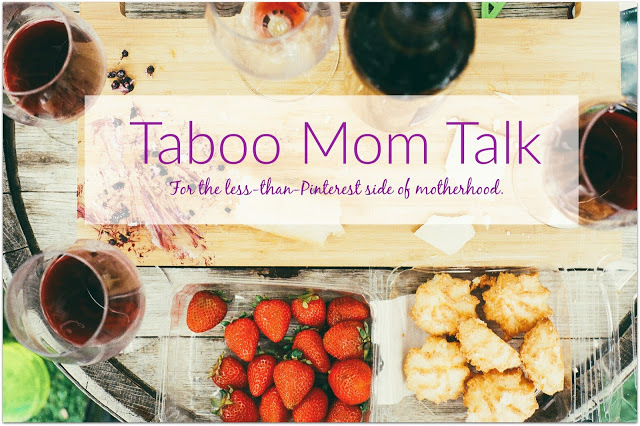 If you have an idea for a Taboo Mom Talk topic, leave it in the comments and we might just tackle it! I looove these Blab chats! They are so entertaining. I didn't realize you guys already did three. I watched one other one where it was just you and Colleen. Do you know if the other one is posted anywhere? Episode 2 was crashed by Blab and we weren't able to record it....whomp whomp! I can't tell you how many times I get the "oh you have a girl and a boy, now you're done!" or "the perfect family!" I mean, we had always decided two was a good number for us, but that's a strange comment...I would have been happy either way! Isn't that such a weird thing to say to someone?? It never occurred to me before that people actually say it to a pregnant mom but ugh. Not cool. I loved watching your chat with Courtney! I must say, you are absolutely hilarious as well :) I've hosted a few webinars and live chat events using zoom and have loved that platform if you guys wanted to give it a try! I just subscribed via email and hope to catch the rest of the video series! !